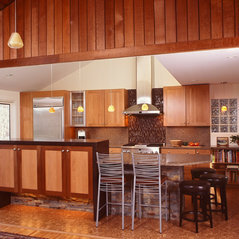 Clark Construction, Fairfield County's Remodeler of the Year, provides comprehensive design/build services, specializing in whole house renovations, room additions, and kitchen/ bath remodels. 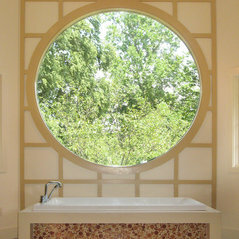 The award-winning Clark Construction team has transformed hundreds of Connecticut homes. With their client's personal style and budget clearly in mind, the firm produces distinctive designs that respect the beauty of the home's past while building in new functionality for the future. Clark Construction 's approach has earned it many repeat and referral clients because we get the job done right — bringing skill, precision and meticulous craftsmanship to every project. Our team shares a commitment to creating a worry-free construction experience that features creative design solutions, a well articulated process, attention to detail and a focus on superior quality. One recent client summed up her experience working with the firm by saying, "Never in my wildest dreams could I have envisioned your design solution. 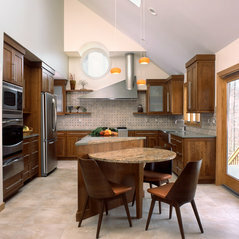 The project totally exceeded my expectations!” We love what we do, and it shows. We pride ourselves on a powerful team approach and the high caliber design for which we have become known, whether your project is big or small. From additions, and whole house makeovers, to kitchens, baths, basements, garages and pool houses, we do it all, within a tight geographical area of our office. We're known for our exceptional process that allows us to consistently complete jobs on time (or earlier!) Because we only work in a limited geographical area, we are able to minimize driving time, thereby maximizing our hands-on time at your home, which pays benefits for our clients.. It is our ambition to perform at the highest standard of honesty and integrity, to treat everyone with respect and to ultimately make the process enjoyable for everyone involved. 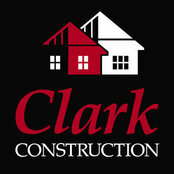 Clark Construction is not only dedicated to our clients but to our staff as well by nurturing an atmosphere conducive to the staff’s personal and professional growth. We have earned a reputation for improving the fabric of our community, carrying our core values into everything we do. We encourage our team to extend themselves beyond the walls of the firm into the community at large in a positive fashion; whether with Habitat, or Trackside, or other organizations close to our hearts. Clark built a custom deck for us. They did what they said they'd do, they were courteous and professional. Their price was great considering the overall value and quality. I was VERY impressed. 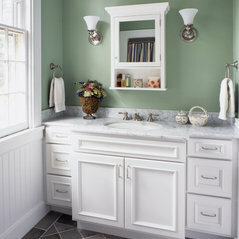 Commented: Bath paint ideasIt was a Benjamin Moore custom color, but their acadia green 2034-40 is a close match. Commented: what is the wall paint color? Thank you!I'm glad you like it. It is a peaceful green. 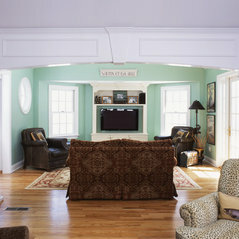 It's a custom color that we had made in the Benjamin Moore paints, but it is close to their acadia green 2034-50. Commented: Can you tell me what the brown/red paint color is?Benjamin Moore King's Red from their Williamsburg Collection. It has just a tinge of brown in it so that softens the red, so it feels warm with out shouting out RED RED RED.